With the concept of a smart boutique hotel, the Basss plays with a vintage design style, graphics and contraction giving a really cool vibe for the visitors. The building, typical of Parisian suburbs, mixes elements of Scandinavian and French design with the latest fashions in upcycling. 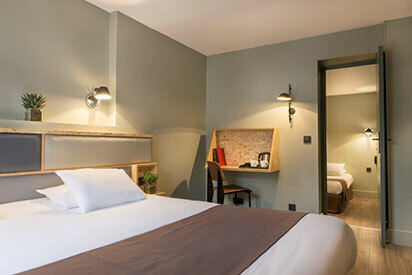 The 36 rooms unite modernity, simplicity and comfort to create an atmosphere that can be easily adapted. While it can become a little boring having visited Paris too many times, you can enjoy teatime and try typical New York pastries and flavoured coffees. B.D.